The quilt block chosen for our second barn quilt was "Grandmothers Monkey Wrench". This is a favorite of Larry's. Larry's grandmother Clara Flook was a well know quilter in the Myersville, Md. area. She started quilting at a very young age with the tutelage of her mother Susan Grossnickle Leatherman. Clara's talent flourished as did her quilts. Her children, grandchildren, and great grandchildren were blessed with quilts that she pieced and quilted. Now her great-great grandchildren are aware of her legacy. Several of her quilts were used as fund raisers for the Myersville United Methodist Church. Clara made this quilt for the Myersville United Methodist fund raiser. Larry let it be known that it was going to be purchased by him. Clara had help with the quilting. Several ladies got together and quilted on this quilt. One evening I went down for a quick visit. Grandmother was removing stitches. That was a bit amusing. Evidently one of the quilters stitches were not up to grandmothers standards. Grandmother was a perfectionist. Her quilts reflected the level of her artistic value. 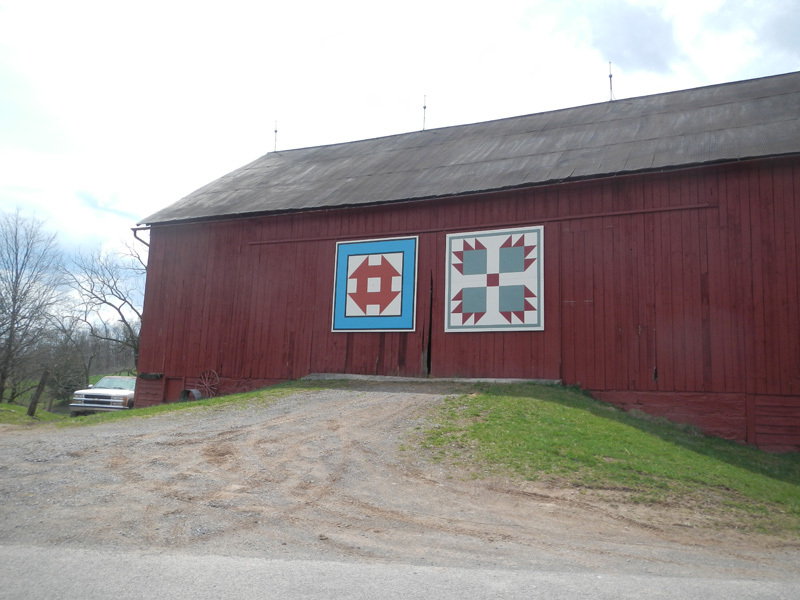 This vibrant quilt will be the second quilt to grace the old historic bank barn on the Flook Homestead. Quilts may have some of the same designs but the placement of the color gives each quilt its own individuality. The blue makes this a very striking quilt. We feel very blessed to have the heritage of so much talent from our linage. We have the history of God, Family and Country. We know the importance of those values. That history continues in the family. Our oldest son Nathan served as a Marine and was in Desert Storm. He had two uncles who gave their lives in World War II. My brother George Edward Piper served also in the Air Force during Desert Storm.